Share recipes and cooking information. Chat about kitchen appliances including ovens, cooktops, rangehoods, stoves and dishwashers. Glass kitchen splashbacks, stainless steel splashbacks, splashback tiles and more. Looks great what is the name of the flooring? Kitchen cupboards that look like drawers? Window or Mirror Splashback ... Love them or hate them? This looks gorgeous! Do you know approximately what you paid for it? Island Bench - single sided waterfall? Thanks all. Will just do the overhang. Hi just wondering what you have picked. We too are choosing Caesar stone Organic white. what Kitchen Mixer do you have? Atec stone - any ideas? Actually there is no defined standards. You must provide details about space available in your kitchen to the installer. How to buy kitchen cabinets from China? Poor quality is because you did not find the right business, the Chinese people have a word called "a penny of a penny" who want to be cheap can buy good quality goods. Can anyone tell me the standard cost of Silestone Cat 5 per sq metre? Polytec Vanette black or 2 pac polyurethane black matt? Granite or Quartz for kitchen countertop? No, you are correct. Just get them to leave it open and get a joiner to install drawer hardware later. Laminex Diamond Gloss Benchtops Anyone? What did you end up going with, I am looking at a few of these! Ours are not those "45 degrees cut top of the front (sharknose?)" and are certainly are not hard to open or close. A windows manufacturer can make a window any size, within certain upper and lower limits, neither of which applies in your situation. Who told you that, the salesman? Did you believe them? Its not true. CaesarStone is very durable! Caulk between floorboard and kitchen island? 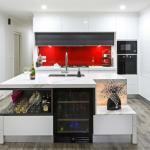 Kitchen design and renovation experts in Perth. Unbeatable Prices - we tailor your kitchen to meet your budget. Unbeatable Quality - Enjoy peace of mind with our Kitchen Craftsmen Guarantee. Unbeatable Service - Our friendly team of professionals help you every step of the way.